It couldn't make more sense than to get right into the middle of things at the Charleston. NF has booked so many bands into so many venues, I have to, and maybe even want to hit the smaller, overlooked venues because great bands are still playing there and I won't be fighting crowds at the Wavves show. 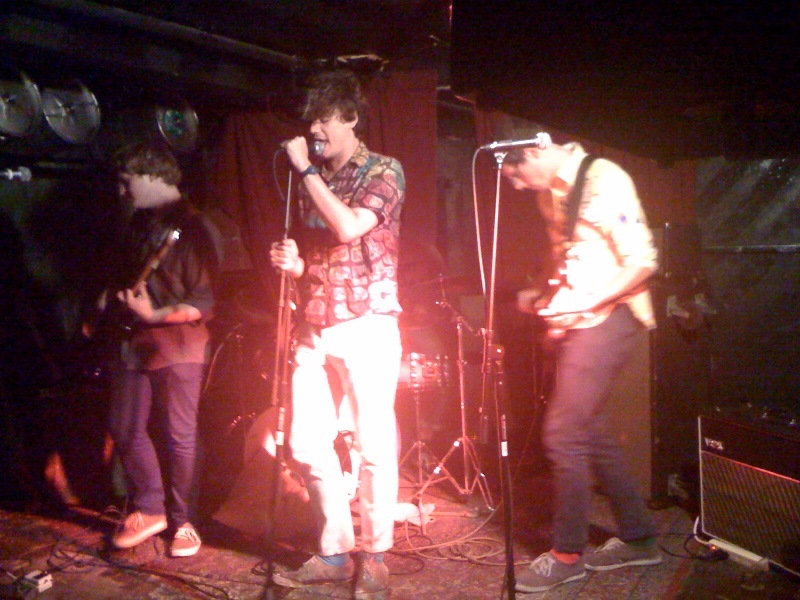 There's nothing like seeing a dirty, garage-y whatever band under a...I would even go so far as to say, historic bar. It's been in Williamsburg longer than I have, and at this point if it's not a condo or about to be then it better be landmarked. That basement feels like a house party from high school, clip lights, the faint smell of barf, or is that the line of kegs next to the stage 'area'. And this setup was a huge improvement from the last show I saw there. I made it early enough to catch I'm turning into who curated the night and if they wanted The German Measles as a part of their set, then they were worth checking out. 3 Pretty unassuming guys, cracking jokes with everyone, rocking tank tops...as their set went on it went from heavy 70's jam to punchy Dinosaur Jr. indie pop. They switched instruments so much no one is pegged as the drummer or guitarist. I think the fact they couldn't really be pegged musically either is why they ended up being so good. It's a classic indie pop, that veers a little into the minimal post area, high feedback melodies over a speed bassline on 'I'm going' gets started with a classic indie quiet/loud foundation, but vocally they're harmonizing as loud as they can...it's great. This song could carry an entire single on it's own. If they keep messing with expectations like this, they are going to have one hell of a great full length where the momentum of the last track is literally going to force you to flip it over again. The German Measles were up next, consisting of a couple of guys from Cause Co-Motion, I keep forgetting. I wanted to see Nick again after a show at Death by Audio a while back...his performance feels completely unhinged...he's not a drunk mess, there's just something unsettling about how into the show he gets. I can see right away why he's got to be the lead. You might occasionally end up with an uneven performance but the audience doesn't know where he's going, and that's a good thing. Combine that kind of tension with this reckless kind of garage punk and I'll be catching them again...just wish I could find that EP they put out on Captured Tracks. 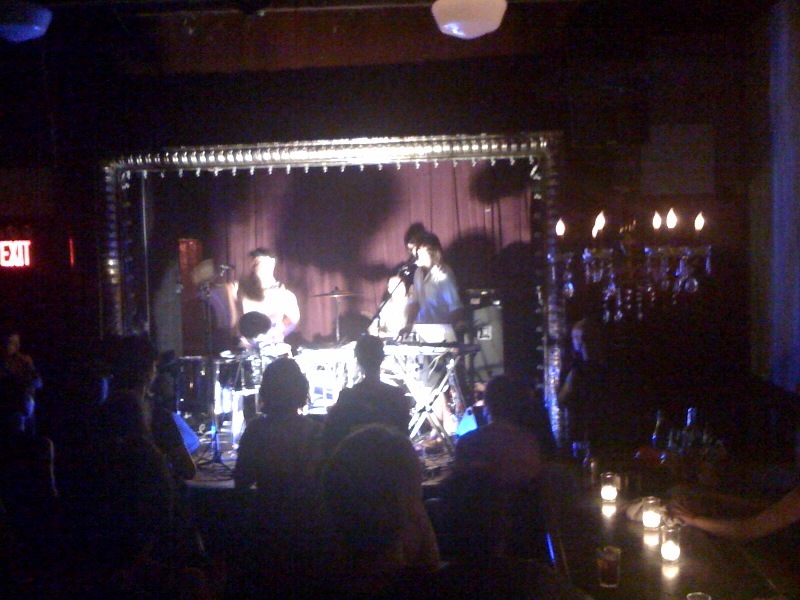 From there Aa was still on at Union Pool, and as much as I love the drunken mess of bare bones drunk punk I was into catching their Battles, Black Dice brand of soundscape especially live...it gets looser, the kind of synth samples get better on the fly, and two drummers live...well that you can't really capture on their recordings. It's violent up there, with the yelling into effects and strobe lights. And I think they're underestimated...they've been (not so) quietly gong places the Liars and These are Powers abandoned for their own idiosyncratic directions...it's a more chaotic sort of math leaning percussion experiment. The vocals turn into just another sound, the electronics keep up with the sets of live drums to get a maximum range of expression through a simple hit. They've been headlining for years, and should be right up there in credibility with Lightning Bolt and Japanther. On this cabaret red curtain stage is ridiculous...they're made for the warehouse basement, but that's again that's what Northside is doing...putting more bands in different spaces, just so when you step back and the dust settles, it's gong to be impressive, even for Brooklyn, you're going to take notice.